Last Week in Review: Stocks have been getting clobbered while Bonds and home loan rates hover near their best levels of the year. Forecast for the Week: The markets are closed Monday for Columbus Day, but then key news on consumer spending, inflation, manufacturing and housing follow later in the week. View: Ensure your customers have a great experience with these seven steps. It's been said that history repeats itself. That seems to be the case as we approach the end of the Fed's big Bond-buying program. Read on to learn why. 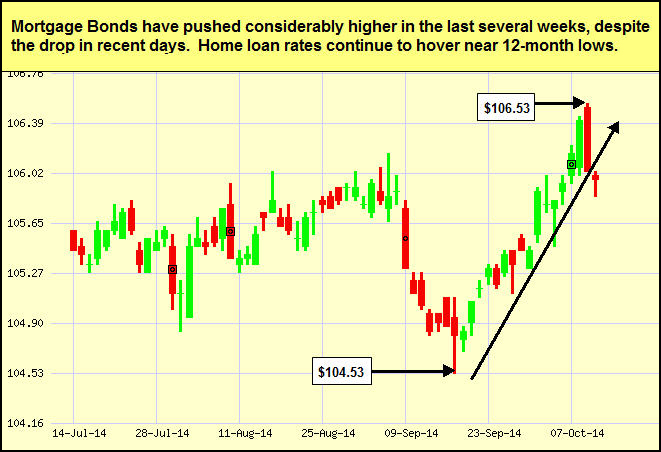 In recent weeks, Stocks have seen a sell-off while Mortgage Bonds have pushed considerably higher. Why has this happened? Concerns about slowing global economic growth have pushed investors into the safe haven of the Bond market, and investors have also secured profits with Stock prices near all-time highs.But there's another reason that's important to mention. After the first and second rounds of the Fed's Bond-buying program (known as Quantitative Easing) ended, Stocks performed terribly—and that behavior seems to be repeating itself as the Fed's latest version of its Bond-buying program is nearing its end later this month. But that's not all that could impact the markets in coming weeks. If corporate earnings are worse than expected, Stocks could continue to drift lower, meaning Bonds and home loan rates could continue to benefit. This will be a key story to monitor in the weeks ahead. In housing news, research firm CoreLogic reported that home prices rose by 6.45 percent from August 2013 to August 2014, which is down from the annual figure reported in July. CoreLogic went on to say that home prices are 12.1 percent below the peak seen in April 2006. 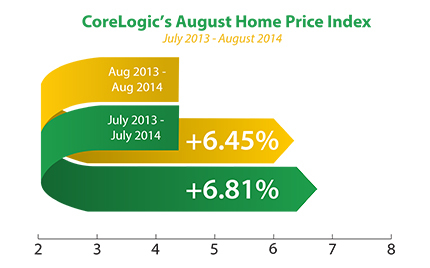 Looking forward, prices are expected to increase 5.2 percent from August 2014 to August 2015. The takeaway from this is that home price gains have slowed to more normal and sustainable levels, after the large appreciation seen last year. Remember: Weak economic news normally causes money to flow out of Stocks and into Bonds, helping Bonds and home loan rates improve, while strong economic news normally has the opposite result. The chart below shows Mortgage Backed Securities (MBS), which are the type of Bond on which home loan rates are based. When you see these Bond prices moving higher, it means home loan rates are improving—and when they are moving lower, home loan rates are getting worse. To go one step further—a red "candle" means that MBS worsened during the day, while a green "candle" means MBS improved during the day. Depending on how dramatic the changes were on any given day, this can cause rate changes throughout the day, as well as on the rate sheets we start with each morning. As you can see in the chart below, Bonds have improved recently, helping home loan rates remain near their best levels in the last year.